spring trend 2015 : the shirtdress. Shirtdresses are everywhere this season and it is easy to see why. They are so easy to throw on, dress up or down, and still look chic. I love this color blocked one from ASOS. It is slightly different than all the other versions I have seen in most stores and fits a little more snug so you don't need a belt. I can't wait to wear this number when there isn't snow on the ground! 1. Wear a belt to accentuate your waist. 2. Throw a blazer over it to make it office ready. See my take on another spring trend here. I never thought I'd say this, but this outfit suits the melting snow so nicely! I really love the colorblocking in that dress! 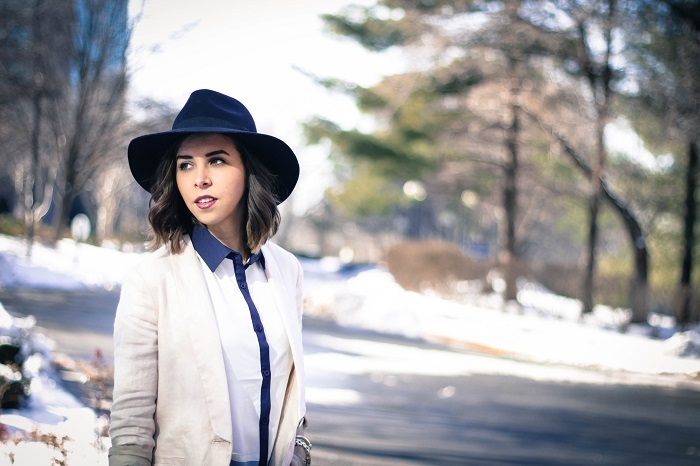 Love the simplistic styling yet versatility of the shirt dress and your hat is fantastic. I love your take on the shirt dress. The color blocking on the dress is just gorgeous! I've been on the hunt for a good shirt dress. I love this one. Not to mention you styled it perfectly. That hat makes this outfit, you look great! Shirt dress is one of my fav Spring trends too. It's so classy and chic! I love this one that you picked out from Asos. I love the color blocking and how you layered it with a blazer!